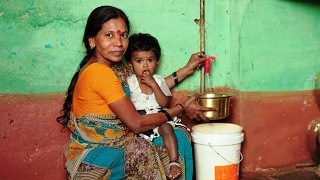 Water from the tap 24 hours a day, seven days a week is a distant dream for almost all Indians. Even those fortunate enough to have a tap receive water for a couple of hours a day at most, and often only on some days a week. Everyone spends large sums to get water— the rich install expensive tanks, pumps, and filters, while the poor often do not have any water connections at all and have to queue up for hours at municipal standpipes, wait for tankers to supply them, or buy water from private sellers. While villages in Maharashtra, Punjab, and Uttarakhand are piloting 24/7 water supply, there is widespread skepticism that water can be provided continuously in India’s urban areas. Karnataka has now proved that 24/7 water supply is indeed possible, affordable, and sustainable in urban areas. About 200,000 people in Belgaum, Gulbarga, and Hubli Dharwad are now getting continuous water supply under the World Bank-supported Karnataka Water Supply Improvement Project. The introduction of water meters and payment of tariffs based on water use has reduced citizens’ private expenses for securing water, led to the generation of revenues for the municipal water service provider, and helped conserve water. The experience provides valuable lessons for other cities and states that strive to improve water supply for their citizens.